The markets have finished down over the past week with the S&P 500 down -0.25%, the Dow Jones down -0.29%, international stocks (EAFE) down -0.42% and US Aggregate Bonds up 0.04%. Top asset classes for the past week include Oil (5.39%), Commodities (2.16%), and Energy (1.68%). Bottom asset classes for the past week include Silver (-2.55%), Telecom (-2.49%), and Italy (-2.38%). 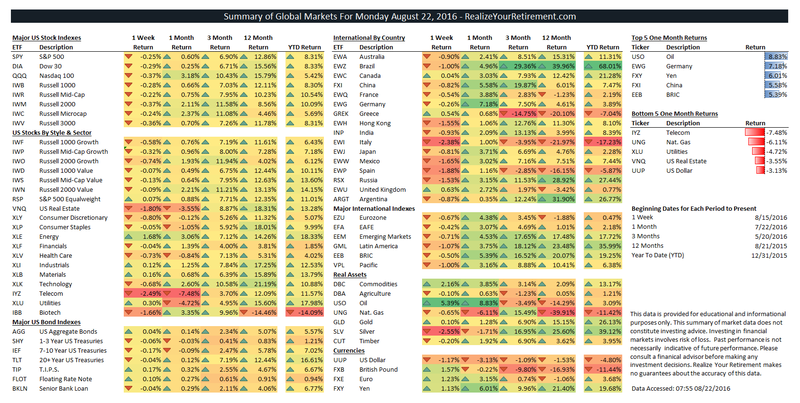 Top asset classes for the past month include Oil (8.83%), Germany (7.18%), and Yen (6.01%). Bottom asset classes for the past month include Telecom (-7.48%), Nat. Gas (-6.11%), and Utilities (-4.72%). Telecom has continued its decline, falling a further -2.49% this past week, bringing its total 1-month return to -7.48%. While it has had a tough month for both Telecom and dividend-producing utility stocks, both are still positive for the year, with Telecom’s year-to-date returns of 11.57% and Utilities’ YTD returns of 17.98% still ahead of the S&P 500’s 8.31%. 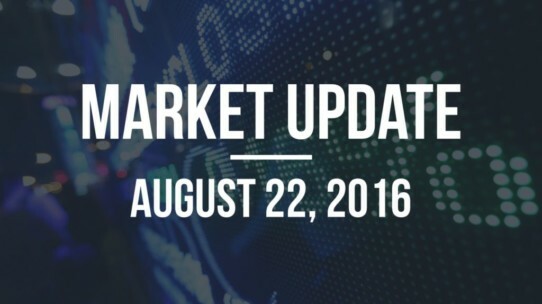 US equity markets end the week fairly flat, down slightly with the S&P 500’s return of -0.25%. Investors who have previously been heavy in defensive stock sectors such as Utilities and Telecom, and US real estate, have been rotating out of those sectors, trimming the gains of each for the year. There has been a rotation out of defensive sectors which can be indicative of increasing investor sentiment in the markets as investors move away from the less risky assets they piled into during volatile times to more risky assets as markets climb and they feel safer. Bonds were mostly flat for the week and month with returns of US bond classes ranging from -0.17% for the US 10 YR to 0.17% for TIPS. Bonds remain a strong asset class for the year. There have been declines in several emerging markets over the past week such as Italy (-2.38%), Russia (-1.53%), and Brazil (-1.00%), slightly reversing their strong returns over the past month.